Since 1999 Os Kulturutvikling has arranged the Os International Symposium of Sculpture every second year. The story of this international happening started when artist Arne Mæland from Os went to Carrara to learn more about sculpturing. In Carrara Boutros Romhein became his teacher. Romhein was both experienced with the symposium tradition and equipped with the right contacts. He inspired Arne Mæland to organize a symposium back home in Os. With a lot of help from engaged volunteers the first Os symposium was held in June 1999. Boutros Romhein had marble sent over from Carrera, he established contact with artists and generously shared his experience. He was also among the participating artists the first year. 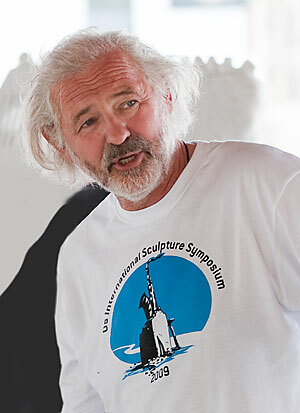 12 sculptors from 8 countries – three of the artists were from Norway – joined the first symposium. They worked 14 days to finish their sculpture. A big tent served as shed from sun and rain. The working area was located nearby “Oselva”, a well known Norwegian salmon river. For three more years the symposium was held alongside the river. Then the event was moved across the river to the old vognhallen, where also the 2017-symposium will take place. Vognhallen is a an old garage (70 meters long) built to house the carriages used on old the Os- Bergen railway (1894- 1935). Vognhallen offers far better working conditions for the artists, thus they no longer have the salmon and the river so close. As a rule the symposium is equally composed of new artists and artists who have participated earlier. Os International Symposium of Sculpture is special in many ways. Making the event an important happening embraced by the locals has been a major goal since the arrangement first took place. The symposium is located in the very town centre, where the visitors come close to the artists and their working process. This enables the viewers to see how the rough stone transforms to a beautiful sculpture during the two hectic summer weeks. The artists on their hand are invited into the lives and doings of the people of Os. They are lodged privately. Regular symposium participants return to the same family year after year and develop a close relationship with “their” family.